A network bridge is a device which "bridges" two networks together so they can communicate directly with each other. In our scenario, we will be bridging the neighbor's public wi-fi hotspot with our home network. Linksys makes wireless ethernet bridge products, but according to Amazon's reviews they are not necessarily the best on the market. We want to be able to use our new internet connection (via the neighbor's wi-fi hotspot) from anywhere in the house, so we'll do this with a wi-fi router, also known as a "wireless access point". Power Over Ethernet is a rather clever way to get electricity to networking gear when installing an electrical outlet or running a long extension cord is out of the question. Category-5 ethernet cable, the standard network cable we all use on a daily basis for nearly all computer networks, has eight individual wires inside which fan out into the plug at the ends. You can see each wire if you look through the clear plastic on the tip of any network cable. Only four of those wires are used for network communications in standard environments, so clever engineers have built devices which can transmit low voltage DC power over some of the other, unused wires. This makes for a great way to get power to networking gear when it's installed in, say, your attic so it is as close to your directional wi-fi antenna as possible. You can either build your own, buy an inexpensive one, or buy a really fancy one. The choice is yours, and probably will be dictated somewhat by your budget. This will depend greatly on your unique situation, but you will probably need a mast and some way to affix that mast to your home. There are all kinds of mounting devices - chimney mounts, vertical wall mounts, roof mounts, etc. Many devices come with wall mount hardware, so this may be a redundant step. We recommend this site to find mounting hardware and many other wireless networking goodies. We want to keep the coax connection between your directional antenna and the bridge as short as possible to reduce signal loss. That's the whole point in using the POE device in lieu of an extra long coax cable. Also POE is way more interesting than a lossy length of coaxial cable. 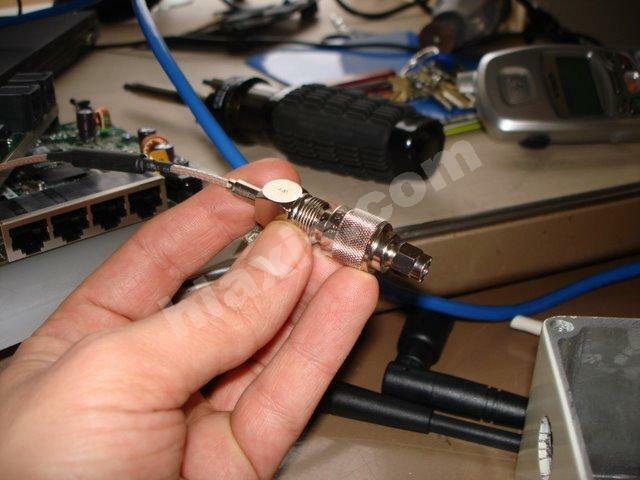 You can obtain the proper length and type of coax antenna cable from the same place you get your antenna. For details please see this informative article. Also, Fab-Corp is an excellent place to get adapters, connectors, coax stuffs, and other geeky items you may need for this type of project. You'll need enough network cable to reach, easily, from your Access Point to the Bridge. Make sure you get enough, but try not to go more than 300 feet. If you don't have one, and you're not limited in your budget, you absolutely, positively, no matter what, MUST HAVE one of these . It is by far the very best power screwdriver ever created, and no handyman/hobbyist/homeowner should go without one. You need this. Trust me. I'm not messing around here. You will seriously be emailing me when it shows up because you can't figure out how you were ever able to survive without one. This isn't actually a requirement, but everything is so much nicer when it's wall mounted. Get whatever screws or shelf unit or whatever to make it mount up all nice and out of the way. Some devices come packaged with wall-mounting hardware.